I always liked the posts about the emptied products, so I consider normal that my first post is about my empties. 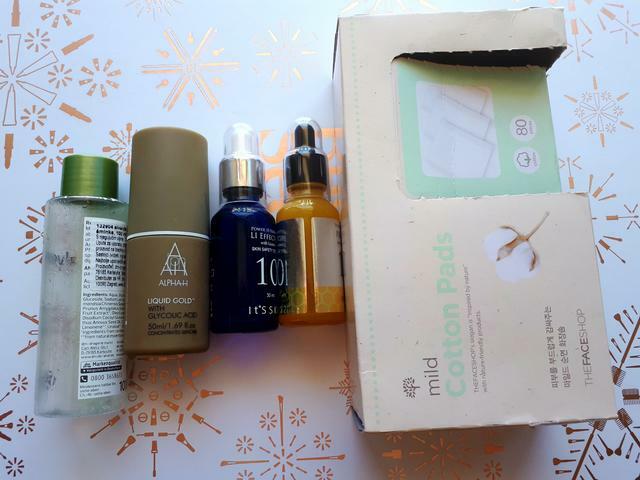 Most of my empties are Asian beauty products, but I use also “western” products. The Body Shop Shea hand cream (travel size): I really like TBS products, especially the body butters. This hand cream is no exception to that. It sinks in fast without leaving greasy residue, provides the decent moisture and it smells quite nice. 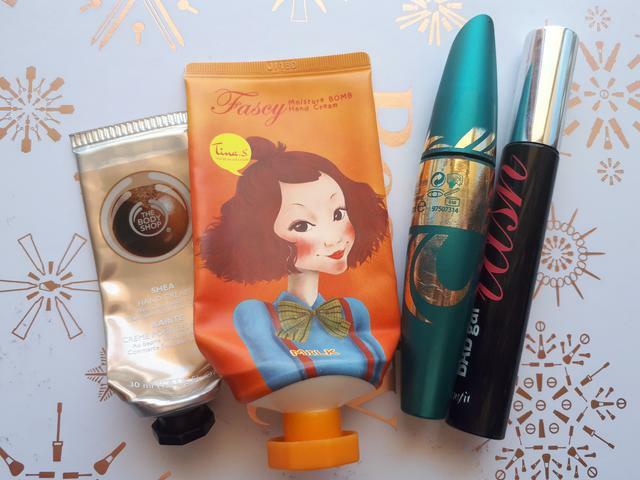 Fascy Moisture bomb hand cream Milk: I had high hopes for this one, but unfortunately I was a little bit disapointed. Beside very cute packaging and a kind of vintage scent reminding me of Nivea cream, I didn’t feel that moisture bomb like the name of the cream says. It sinks in fast, but doesn’t provide enough moisture. Won’t repurchase. Max Factor Voluptuous False Lash Effect mascara: this was decent mascara which was fine for my needs. It gives my lashes the volume which they are a bit missing, it is not too wet, has nice black color, but it does not smudge. Benefit Badgal lash mascara: this was complete miss for me. I didn’t use it for a long time, it was driving me crazy because it was smudging my undereye area. I looked like panda till 10 o’clock in the morning (I usually put my make up around 8:30 am). Obviously there will be no repurchasing for me. Alverde eye and lip biphase make up remover: another big miss for me. I was looking for a replacement for Asian makeup removers, so I bought this in DM. I was so happy when I finished it. I needed 4-5 cotton pads to remove the make up and I don’t even use the waterproof mascara. It stinged my eyes like crazy and this is a huge NO for me since I wear the contact lenses. Alpha-H liquid gold: this was my first AHA product I tried and I really love it. I had no side effects of any kind: no redness, no flaking, no bad reaction of any kind. Applied at night, the next morning it left my skin soft and shinny, with nice texture. Depending on how lazy was, sometimes I used it as only product in my routine and sometimes I put my whole routine after waiting for at least half hour. Lately, I use it in conjunction with Mizon ph adjusting toner and they are a perfect match. I already bought the bigger bottle of Liquid gold, but it is in my stash waiting for the autumn. It’s skin Power 10 formula LI effector: I think this was my 3rd bottle. It’s my go to serum everytime I feel my skin will react to something (overloaded routine, bad product combination or else). This licorice serum calms perfectly my skin, evens the appearence and smooths it. I have already repurchased and opened the new bottle of this. It’s skin Power 10 formula propolis effector: I also bought few bottles of Propolis effector. Generally speaking, these It’s skin serums are excellent investment: not expensive at all and yet very effective. Propolis effector is my favourite product containing propolis. My skin is moisturized, but not greasy or sticky like with some other products with propolis. It gives my skin perfect healthy shine. Will repurchase again and again. The Face Shop Mild cotton pads: one more product which prouves that Asian beauty brands are ahead of western ones, even with the cotton pads!!! These do not “swallow” the product. They are so soft and feel so nice on the skin. I used them both for removing make up and applying some liquid products (acid, toners,..). This is all for my first empties! Stay beautifull and healthy!